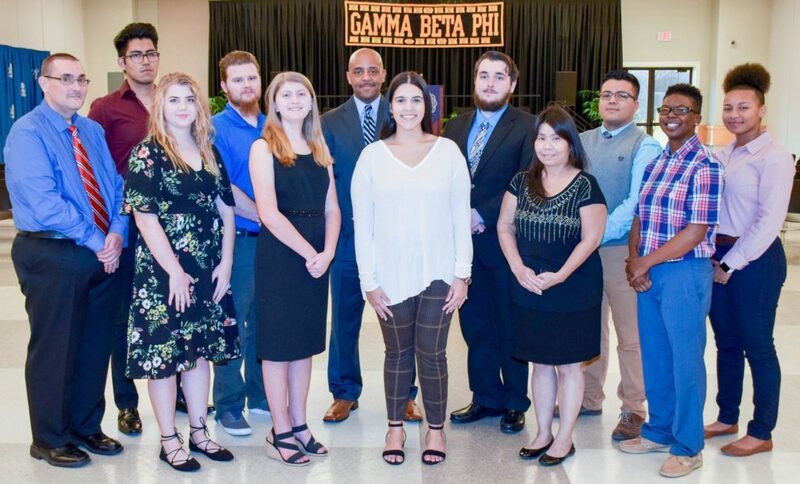 Nash Community College’s Gamma Beta Phi chapter inducted new members Tuesday, October 30, 2018 in a ceremony held in Brown Auditorium. Gamma Beta Phi is a national honor society emphasizing service, scholarship, and character, and aiming to broaden its members’ academic and philanthropic lives so that they might make a difference in the world. NCC’s chapter was chartered in 1975. The organization was created by a group of southern college educators as an extension of the Beta Club, a high school honors society. Each chapter focuses their efforts on the needs of their local community, and the Society as a whole leaves a long-lasting impact on the nation through its annual national service project. Inductees in the photo, from left: Curtis Griffin, III, Mauricio Avila, Sara Joyner, David Jones, Hannah Whitehead, Orah Pierce, Makayla Fields, Jacob Smith, Laura Louie, Abel Raya Cabrera, Azariah Farmer and Tanylia Caudle. Not pictured: Hunter Andrews, Angela Bennett, Jennifer Daniel, Adam-Augustine Griffith, Miranda Massey, Emily Savage, Gregory Sledge, Jillian Villazon and Dakota Wilson. The chapter’s 2018-2019 officers are: Vice President Ellis Perry, Treasurer Margarite Jackson and Secretary Christiana Daniels.